December 2013 - An Opportunity to Celebrate Life! Day two of ‘skiing the fish’. I wanted to get back up on the slopes so that I didn’t totally lose the cellular memory of my ski lesson. For Christmas, CrisMarie gave me a private ski lesson. 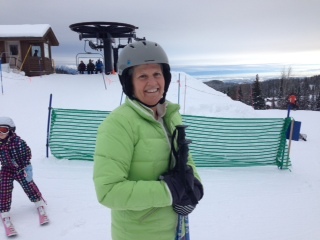 Three hours on Boxing day with a wonderful ski instructor, Linda Miller. I have been saying for over a couple years that I wanted to learn to ski. Not for the usual reasons. No. I wanted to learn to ski so I could skin up the mountain and ski back down safely. Yes, I am a born up hill gal. CrisMarie had tired of me saying I wanted to learn and not really making it happen. It is something I love about her. She pushes me when I am saying one thing and not doing anything to act on it. Of course, I decided to head up the mountain this Sunday early, thinking most of my follow skiers were going to be in church. Wrong. Apparently today was the busiest day of the year for the mountain, and it didn’t help that snow was falling. Yes – there were lines. But honestly, I was amazed at how quickly I was able to get my lift ticket, rentals and even bought my first set of ski goggles. I was in, out and on the snow in less than thirty minutes! As for the skiing, well, I think I did pretty darn good. I had fun. I practiced everything I was taught in my lesson and managed to enjoy the company of a number of other folks learning like me – when I avoided running into them on the slopes that is. – Learn how to stop, start and turn. I like taking wide turns and enjoying getting into some sort of dance experience with the snow, the mountain and all the folks around me. So far I have managed to stay upright on my skis. This skiing experience is a bit like my experience of discovering golf this summer. I imagine much like my golf, if I saw a video of myself skiing I would see just how much of a beginner I am. I remember seeing a video of my golf shot and being a bit horrified at just how different it looked than Chris Newton’s (the golf pro at Whitefish). Maybe I shouldn’t even imagine there would be any similarity. But still my inner golfer did imagine that I had a much better stroke. Luckily, I am not aiming to be a great golfer or a great skier! So my inner experience is really all that counts! It is my intention to take some more ski lessons and like golf maybe by the end of the winter ski season I will be able to call myself a skier. Even more importantly, I will be able to skin up the mountain and safely make it down!! Life really is all about learning, play and trying new things. That’s what keeps the brain fresh, the body young and my heart open! For the past couple weeks I have found myself searching for Hawaii vacations. The idea of a sandy beach and warm ocean water are incredibly appealing to me right now. Of course, the timing is lousy. I have a series of client days alrea dy booked. Plus it’s the holidays. So it’s one of the more expensive times of the year for travel. How did I get to this point where a vacation seems almost a requirement? I have been working for 27 days straight without much more than a few hours off, really. Between face-to-face hours with clients I have been trying to build a stronger social media presence, writing, reading and posting to ensure our new brand and website gets up and running. I have some extended family issues that demand attention and connection. My office is at home. So it is easy to work at night and often without much of a break. I don’t think this schedule is uncommon for a small business owner. However, I also don’t think it’s healthy or productive. So what to do? Hawaii really isn’t the solution. No, what’s needed is counter intuitive. Instead of working more, sleeping less and soldiering on, what I really need is to interrupt my work on a day-to-day basis and build in REST & PLAY. Yes, that’s right – two words that are rarely used in business, but are essential for success: REST & PLAY. Let’s start with REST. A great deal of study has been done on elite athletes. One interesting study involved tennis players and how they utilized the breaks between games. The best results came from those who totally shut down during their breaks. No coaching, no music, no mental replays – just stillness, quiet and resting. Another data point involved world leaders such as Churchill and Kennedy, both of whom were known for taking ten-minute naps throughout the day. It seems that after 90 minutes of mental concentration our abilities diminish quickly unless we take a break. Ten minutes is really all we need. Take a nap. Take a short walk outside. But make it a clear break. This is not easy. I know I often want to plow through and not take an actual break until the work is done. It was helpful to learn that elite athletes and world leaders take naps and breaks. Maybe I could as well. PLAY – that comes a bit harder. However, this may even be more important. It’s easy to think of play as something children do, but there is so much more that play has to offer. There’s an actual National Institute of Play, who’s founder, Dr. Stuart Brown has been conducting years of research that shows the importance of play in terms of transformation, creativity, problem-solving and dealing with power differentials. Stuart Brown’s TED Talk on play included an amazing clip involving a small husky dog and big hungry polar bear. The husky was certain to be the polar bear’s lunch! Instead, the husky invited the bear to play. A simple play bow invite from a small female husky to a predatory big polar bear resulted in a new storyline for the husky. Instead of a fight to the death the animals played, which ended in cuddles. Though the research isn’t as established for us humans, I have little doubt that a sincere invitation to play could do more to bridge differences than any other usual intervention. Why? Because play lights up all parts of the brain. We think more creativity, remember more and develop an emotional regulation that would otherwise not occur. So what is play? Any type of activity that is unstructured and without a defined purpose is one definition. Play can be social. It can be imaginative. It can involve objects or movement. The key is unstructured and without a specific purpose. Something as simple as a 30 second dance can be play, totally lighting up the brain. Doesn’t that sound much more productive than plowing through? Bottom-line: Introducing regular interruptions for short breaks and playful moments will do much more for your business than hours of concentrated effort that later result in dreams of an Hawaiian vacation. Plus, if I am more productive, well, that vacation might become a reality not a requirement. Doesn’t that sound like much more fun? IO’s Indelible Paw Print on Our Hearts! 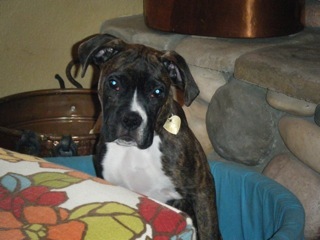 Bailey as we knew him, IO (pronounced E-O) who he became, left us December 16 at 4:45PM at Apline Vet Hospital. That wasn’t suppose to happen. He was only four years and 4 months old, and he had finally found his ‘forever home’ and totally perfect person, Rick. Short Life – Big Reach! The call came from Rick yesterday at 2PM that IO was very, very ill. We jumped in our car and drove to the vet to have a few minutes with IO and with Rick. It was hard to see our super mighty, and previously healthy, dog so, so sick. He was in so much pain that he had been standing and not sleeping for at least 20 hours. It was even harder for Rick who had just days before thought his buddy was fine. Now he’s gone. That is such a blow. I could see the sadness in both of their eyes. IO working so hard to keep breathing and Rick wanting his buddy to pull through, as well as, wanting to do something to eliminate IO’s pain. It is all so sad that he’s gone. Yet even such a short life did indeed leave many a paw print on so many people’s lives. 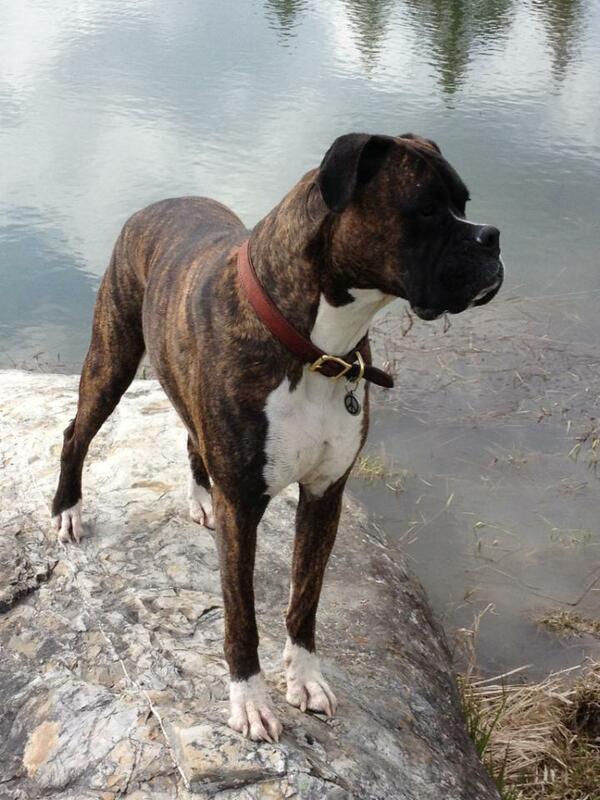 IO came to us as a rescue boxer in December 2009. He was known as Moose at that point. We got him just after CrisMarie lost her brother to colon cancer. He filled a hole and pulled us through a hard stretch. We named Bailey. He was full of life and kept me company as I held a space for CrisMarie to deal with her loss. We both loved Bailey dearly and soon learned as he grew that he needed someone other than us. It wasn’t easy to consider letting him go, until we saw Bailey and Rick together. From their first visit, Bailey seemed at home, like he had found his best friend. Rick named him IO and together they started off on many wild adventures. Hiking, biking, rock climbing, rafting and IO was calm and settled. It was so cool to witness. But it wasn’t just Rick. IO had many friends: Tracy, Jodi, Cindy, Brooke – to name a few. I love to discover the people who knew IO and their stories of how he touched their lives. I honestly don’t know why he had such a short life. I do though believe that he had a rich, full adventure and that he was well loved and loved well. Dogs are and have been so important in my life. They are such wonderful teachers. They live fully. They are loyal. They know how to play. They are blindly forgiving and shake it off when life throws them rough stuff. They will protect what matters to them. They love without hesitation! Moose, Bailey, IO had all of these qualities. And he offered all of those lessons to each of us who knew him. As result his indelible paw print remains heavy on my heart today.